Update: Congrats to #103 Alexis! of the summer for us. and school starts next week. to use as a shield. It's our Rainbow Pack in 5" or 10" squares on etsy. I have yardage of all of these & more, they just aren't on the site yet. If you'd like any, contact me. My foundest summer memory - going to camp for the first time! ALONE! My favorite summer memory is sleeping in the "old red barn" (a smallish out-building that had been turned into a guest house). I felt like Laura Ingalls... and oh, so grown-up! They are oh so cute. Mine would be going to the beach and make sandcastles. Summer is coming to and end! too quickly! ah! they're so cute those Japanese dollies! I think my favourite summer memory from this summer will be to watching my 2 year old girl, Hana, with her "best fend' Nell, sitting in the garden and stuffing themselves with fresh peas, even feeding Nell's dog... Long summer evenings...they'll be missed! the weather is changing here already. Thanks for the chance! favourite summer memory?? Our elderly neighbour picking me up and taking me swimming at the beach every afternoon. I would have been 10 I think and looked forward to it every day. My memory of summer goes back to 1993 or 94 when me, my sister and my cousins used to play family, build play houses and stage dramas in the house. My grandma's house would become upside down every summer with just the 4 of us....:) Love those days!!! My summer memory would be welcoming my baby boy!!! my favorite summer memory is laying on the driveway on a hot summer night getting a "moon tan" as my sister and I called it. Ah...to be 12 years old again! For this summer it would be 4th of July weekend when all my kids and grandkids were together in one place, our home, for a reunion. Being back in my childhood neighborhood. Running around playing tag, freeze tag, hide & go seek, Mother may I & One two three red light!! Catching fireflies in jars than letting them go. Eating burgers outside hot off the grill! Thank for making me remember the simple good times!! Going to the beach with my family! Good times. Thanks a lot for this great giveaway. That charm pack is adorable! My favorite summer memory is sitting in the back yard as the sun goes down talking with my husband, son(18) and daughter (20) about their lives. It doesn't happen often to get every one together, and doesn't happen often to get the kids really Talking! Love those times! I just had a summer I'll never forget. I was off work after having baby #2. We spent summer days snuggling with baby Henry, going to the zoo with big sister, and spending long weekends at the lake. It was perfect! My favorite summer memory is vague, but it involves my cousins from Pennsylvania visiting. We had a delightful evening catching "lightning bugs" (aka fireflies) and putting them in jars to make lamps. Times were peaceful and there was nothing to fear except missing out on dessert. My sweetest summer vacation memory was going to the East Coast... seafood, camping, hiking, ocean toe dipping... it was a most memorable holiday!! When I was a kid my grandparents had a "camp" on a nearby river. It was not fancy, but I loved staying there with my grandparents and various cousins. We would spend the days canoeing and swimming and having outdoor adventures. All my favorite summer memories revolve around the beach. It was, and still is, our local playground/park. Teaching my children to make drip castles, watching them play in the shorebreak as little ones, and watching them surf when they were older. Thanks for the giveaway--such beautiful fabric. Oh, golly, there are so many! Going to the beach with our big floppy hats, camping in the rain (every year, my Dad had a gift), my very first kiss (with a boy I met out of state, swoon!). Catching fireflies in the backyard always was a magical time. Love the fabric. From when I was about 8-10--making doll clothes on a Featherweight while watching Annette Funicello movies on tv (all the beach whatever movies were shown one a day for a week each summer). Going to the amusement park with my then boyfriend/now hubby! spending afternoons at the pool with my kids when they were little. thanks for the chance to win! My favorite summer memory is the summer we went to the Smokey Mountains. I fell instantly in love with the colors, the cooler weather and the beauty of nature. I grew up a city girl so the mountains were a wonderful experience. Spending the summers at our beach house! The pony man! Every summer, when we were very young (like, 3-8 y.o. maybe)the pony man would bring his pony to our street, and just set up in the middle of the street. Someone would set up big yellow wooden police barriers, and the kids lined up, paid some small amount, and rode the ponies round the little ring. Whoa, Nellie! 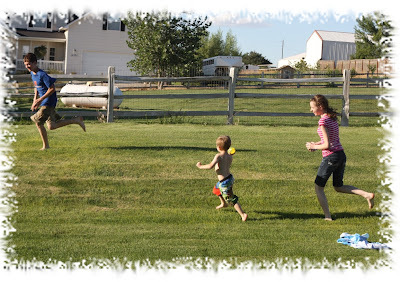 Running barefoot in the grass! Thanks for the chance! My favorite summer memory is going to the water park as a family. The three of us have a great time every year. Thanks for the giveaway! School starts Monday and I've had a great summer with my boys. We camped out in the back, went to the beach, vacation, I had a get away with my hubby for our 10 year anniversary. It's been a great summer! my favorite memory from this summer was having a picnic dinner around the bonfire in the backyard with my daughter, 20 & the hubs. We cooked hotdogs on sticks, enjoyed some salads ... so much fun to enjoy the outdoors :) thanks for the chance to win! My favorite summer memory was in *94 when our son was born. 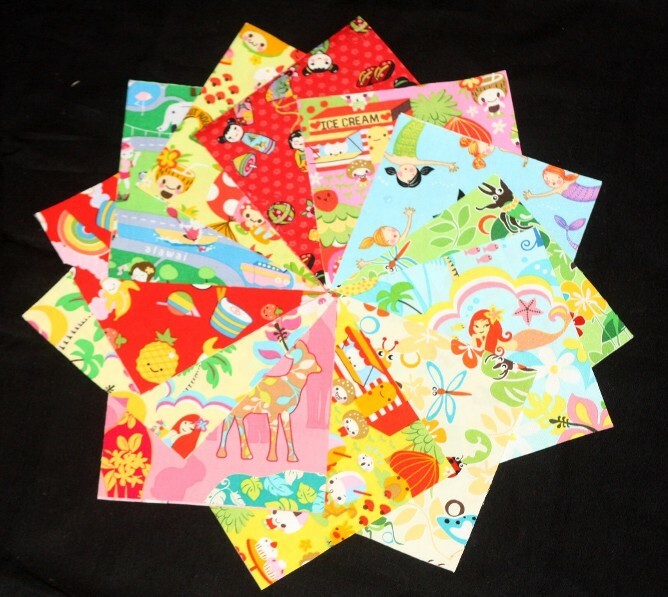 What cute fabrics! Making s'mores with the kids by the lake was a pretty sweet time. Of course I love summer time anyway because I get to spend every day with my kids and that is THE BEST! My favorite summer memory would have to be the year my parents bought a new fridge and I got to keep the box! I must have been three or four years old. I used it as a fort and would play in it all day long. My favorite summer memory is the camping trips we used to take our girls on. Sitting around the campfire wrapped up in blankets and enjoying the quiet all around us. Thanks for the opportunity to enter another of your wonderful giveaways. favorite summer memory? there's a fantastic state park in west virginia, about 20 minutes away from where i went to college in ohio that is the best place to go hiking. i'm not much of a hiker, but the summer of '02 was spent pretty much at that park. gorgeous! My favorite summer memory is to play on the streets and stay wake till the sunset. And of course a lot of icecream! my favorite memory would be going to my grandparents house for a weekend and my grandmother would take me shopping....it looks like everyone had a fun time yesterday...thanks for the giveaway..
Oh my gosh oh my gosh...gotta have!!!! My DD is actually part Hawaiian. Her grandmother is full Hawaiian...but my DD also has always had a huge LOVE for anything Asian. 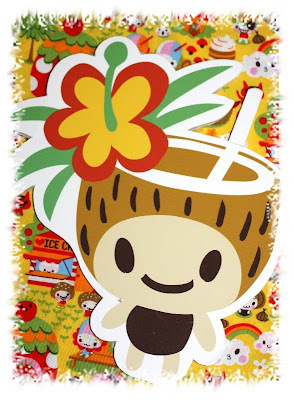 She has always loved Hawaiian and Asian decor and never can decide between them. When do you think you will have yardage available? Going to the beach last summer with my whole family - my fiance proposed! My favorite summer memory would be time with my family in the mountains. Living in Florida, we always enjoyed the beautiful scenery and had some fun adventures in the Smokies. Thanks for such a very cute giveaway. Hi there, my favorite memory has to be going to Wildwood, NJ beach with my whole entire family one year. we had our reunion on the beach. It was so nice. :) thanks for the giveaway! So this summer I surprised my mom and dad by showing up at our family reunion. I havn't been home in 9 years.. it was a super long drive for us, but I just came up and sat down at the picnic table next to my mom, and OH wasn't she surprised!! It was great. 6 of her and dad's 7 kids were there together.. such a great day! My favorite summer memory if of when my 30's something daughters were smaller and we took them to the beach in CA...they adored the ocean and those long summer days. my favorite summer memory is going to the pool. i loooved going to the pool and now my kids enjoy it. My favorite summer memory was my wedding! Summertime: when one can lay in the sun (wearing sunscreen, of course) with a delicious book and a mint-flavored ice tea. Guess that memory is from a few years ago because this summer was mostly too bloomin' hot to be outside without the fear of heatstroke! Thanks for this nice giveaway of some super-looking fabrics. The first thing that popped into my head was the summer I was 11. We lived in an apartment complex with a pool. I'd never had access to a real "in the ground" pool, and I lived there all day every day, that whole summer. Love this giveaway! Those fabrics are so cute! My favorite summer memories are the summer nights sitting on the roof of our 2-story home, watching the stars. Something so peaceful about summer nights - fireflies, crickets, nice breezes. Lovely. My favorite summer memories would be when my cousins and I were little and we would be at my grandma's for a barbeque. We would each get our own little pack of campfire marshmellows. I think they came in a little box. Maybe 8 of them. Imagine having 8 marshmellows to roast just for you! Then we would get jars with holes punched in the lids and catch lighning bugs. They would light the night up until it was time to go home. Then take the lid off and watch them all fly up into the night. Great times. My favorite memory of this summer is Ms. E learning to kick a ball. It was so funny and sweet. Now she doesn't want to do anything but kick her ball, LOL! One of my favorite summer memories is getting to be "only grandchild" at my grandparents for a week. Thanks for the giveaway! This summer our daughter was married in a lovely outdoor ceremony and reception. It was uniquely beautiful. The memories of this day will always be etched as a summer favorite (among others). All the wonderful fun that can be had with a little water!!!!! My favorite summer memory has to be the warm summer nights for eating outside - fresh corn, tomatoes and watermelon too. When I was a child my family would drive to Sacramento (from Portland) to visit relatives or they would visit us. We would visit the Oregon Coast, Mt Hood, or British Columbia when they visited us. On the flip side, we would visit San Francisco, Los Angeles (Disneyland), etc. Fun times. My favorite summer memory is eating bar-b-q and sweet corn with friends and family. Thanks for the giveaway! My favorite memory was the summer I got to spend a week at my grandparents house in New Jersey all by myself. My parents and sister went home to Michigan. It was great to have my grandparents all to myself! My favorite summer memory is playing ghost-in-the-graveyard, andy-over, and catching lightning bugs with my brothers and neighbor kids. Best summer memory was lying on the grass, at the cottage at midnight, watching a meteorite shower on my birthday (Aug. 10). It was spectacular. Love the new fabrics, they are spectacular too. My favorite memory from the summer was the trip to the beach with my grandparents, luckily we got alot to pics to prove and share!!! My favorite summer memory would be any day spent at the beach- especially 2 years ago when I got married at the beach! My best summer memory would have to be from my childhood. Sleeping late and carefree days. Being an adult and not getting summers off STINKS! My favorite summer memory is my daughter's wedding day. My favorite summer memory is going to my grandmothers houses for the summer. All the cousins would be there. We had so much fun. Thanks for the opportunity. My favorite summer memory would have to be going to the "beach" (which was really just the local river, but we all called it the beach! )with my sisters and staying there all day and swimming and having fun! My favorite memory will be my daughter who graduated from college last Saturday with a 4.0! Cute! I loved the summer nights spent in my grandparents' back yard eating watermelon, making homemade ice cream and catching lightning bugs. Those memories make me smile everytime I go out into my own backyard at twilight. Little kids in freezing Glacier Lake in MT, skipping rocks for the first time. Black sand and a baby who loved and was surprised by the cold water. Happy Food People... love it! Favorite summer memory is vacation with my family. This summer was taking my grandchildren to the beach for the first time. Watching lightning bugs in the field. Awesome fabrics! Our family spent a wonderful day at the water park together. I'll be thinking back on that day all through the year. My first recollection (as a pre-teen) of a summer storm coming while visiting in Western Colorado. The wind, the flavor of the air, the warmth. It was magical. Staying up late to watch the fireworks. That was years ago when we were in the States. Now (in Malaysia) its summer almost the whole year. Favorite summer memory is catching fireflies with my kids when they were little and eating by firefly light. My kids are now both grown but I know my daughter would absolutely LOVE those fabrics. 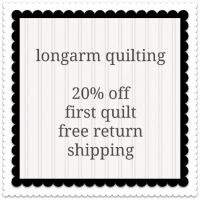 I'm new to you blog -- A Quilting Life sent me over. 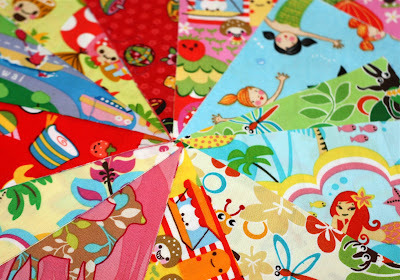 Always looking for new blogs that have quilting ideas! My favorite memory this summer is, without a doubt, time spent with my two little granddaughters -- priceless! We've had lots of great moments this Summer ~ one of my favorites is sitting on the beach by our campsite and the sand was too hot to walk on. So we parked ourselves in the shade, a ways from the water. So we didn't have to worry about our one-year old taking a dive for the water because every time he attempted the sand, he came back whimpering because it was too hot. Better than a playpen! Camping as a kid with my family. Sleeping in our swim suits and jumping into the lake first thing in the morning. going to the water parks with our girls and having picnics! Those fabrics are so cute! Favorite summer memory...spending the week with my grandparents and going to the fair. A few years ago I took the hubs to my hometown for the 4th of july fireworks. What a great time! One of my favorite summer memories is trying to catch fireflies at night. Their little "lights" seem quite magical! I remember years ago playing outside in the water in a bright pink shower cap since I didn't want my hair to get wet. It's even on video. Actually, I have many favorite summer memories. The summer we camped on the beach at Galveston -- exactly one week before they closed it down to beach campers among onther things. Trips to Astroworld (no longer existing amusement park). That fabric is so cute! It reminds me of a trip my hubby and I made to Hawaii. Because of its closeness to Japan, there are a lot of Japanese newlyweds on the beaches for their honeymoon. Favorite summer memories would be playing hide-n-seek till after dark and then catching fireflies in jars. Such a simple life, being a child. A favorite memory for me is on the spur of the moment, Mom and a friend would pack up whatever food they could find for a picnic and then heading to a park where we could swim and play. Then in the evening, our Dad's would meet us after work and we would stay at the park until it closed for the night. Thanks for the great fabric giveaway. 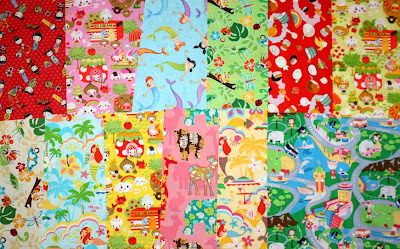 Those fabrics really make me smile - such fun! Thanks for the giveaway. My favourite memories this summer are trips to the beach with my little girl, having picnics and making sand angels! I really like these fabrics! 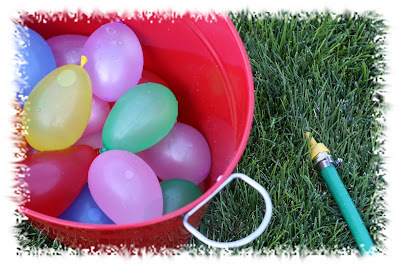 Also loved the picture of the water balloons and who doesn't have a snow sled in the yard in the middle of summer! See how many uses it has?!! Oh, that charm pack is so cute!! Our house is obsessed with anything Japanese "kawaii"
It's a mixed memory, but maybe the summer I went to Turner Falls when I was 13 or 14. My favorite summer memory is picking blueberries and helping Mom with the canning. Also have fun memories of all the good food that came out of the garden. Those were the days!! Going to the farm of my great uncle and auntie for the summer and watching them quilt, and picking strawberries, they were fun for this big city girl. Lots of happy summer times!!! One of the best - in 2006 when we had a double wedding reception for 2 of our daughters in our yard. The day was perfect!! Thanks for another sweet give away. My best summer memory was getting to take a family vacation with our kids and grandkids plus one. We have a 4 yr. old foster child, and he got to go with us. We found out today that he will be here for Christmas and possibly to be adopted into our family! My best Summer memory is from when I was a little girl, my Dad would mow the grass with a push mower, rake it into a mound and I would jump around in it. :) Used to get as itchy as can be later though! My favorite summer memory was holding beauty pageants in the front yard of Christie Harris' house. (The one house on the block where you could pretty much do anything and the mom just smiled.) 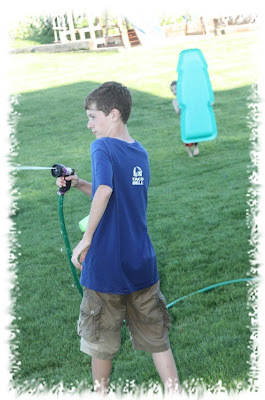 We would make the one little boy be the host and use the hose to outline a runway. Cars driving by would honk for us. We let a different girl win every day. It was silly fun. My favorite summer memory... Would have to be the bed sheet hammocks that my grandmother helped me and my sister make when we spent time at her house. We'd be lulled to sleep and snooze the afternoon away in those things. My favorite summer memory was spending family time with our daughters before they both moved out of state....boo hoo! My favorite Summer memory is staying late (9 p.m.) at the pool so my son could see the underwater lights. He was so delighted I'll never forget it. How cute! Those fabric selections are adorable. It's been a pretty quiet summer for us, it's just been SO hot. I would have to say my favorite memory is when we brought home a 10' round cheap-o snapset pool for our 3 year old to play in and my older two boys and about 5 of the neighbor kids all jumped in to play. We had so many kids squeezed into this tiny little pool trying to keep cool, it was such a sight. They had a blast though! My favorite summer memory is taking my sweet granddaughter swimming and out on the pontoon here on our lake!! My favorite summer memory was our trip to Acadia in Maine. It is just the most beautiful place and the most relaxing vacation I have ever had. one (we make many) of my favorite summer-time memories is, working in the yard with the children & then when we are done & I am 'cleaning; up...Momma uses that hose & no one comes in "DRY"! Oh my word I love to get my children & they scream & carry on....& we laugh & laugh. Love the Hawaiian theme as we are doing my Dad's 80th Birthday in November in that theme for him for his love of his time being station there in Pearl Harbor :) He has been back once to visit! As summer see's it's final chapter coming lets all be glad that we have these fun memories to share! Thanks for yet ----another wonderful give-away! Favorite Summer memory...our family picnic up the mountain. Just our family...beautiful sights... good food...laughter. Family time is the best.